Here's an appetizer that packs a protein punch that will keep you full until dinner. A couple of these along with some salad would also nicely serve as dinner itself. I almost always have a few different kinds of canned beans on hand. There's so much you can do with them! This recipe was inspired by these two recipes. Pulse the ingredients together a couple of times to form a coarse mixture that’s still chunky. If it becomes too sticky, add some more flour and bread crumbs. Coat both sides with the cheese and crumbs mixture. 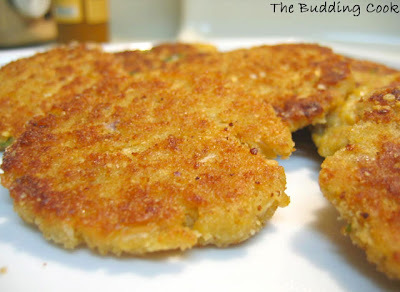 In a large skillet, using as little oil as possible (2-3 Tbsp), shallow-fry the tikkis. Cook each side for about 3-4 minutes on medium heat until golden brown. Serve hot with some tomato ketchup or enjoy it with your favorite chutney. 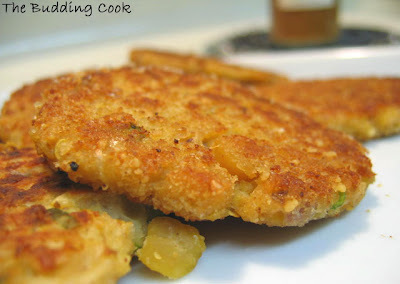 We had these with some mango chutney along with hot cups of tea. The tikkis look crisp & yum, TBC! Protein packed & tasty - nice combi, na? That would be a perfect snack!!! That sounds like a wonderful take on falafel! You've not made your gojju again?! Why not? It so simple and tasty. These look so crispy and golden.. I think they would bake up beautifully too. Awesome. yum yum!! those tikkis sure are good..crispy and delicious..the problem is i can eat all the 10-12 u have made...at a single sitting..shameful na!! Looks great. What do you think about baking these instead of shallow frying? These look very good. Call them tikkis, falafel, cutlets, patties, it doesn't matter to me. These look really good. Nice and golden brown. Yum,,its brekkie time here and these are making me hungry..I so dont want to have cereal now! Fantastic! I haven't been checking out my favorite food bloggers and I'm seeing how much I missed! great recipe and a new one..never seen this before! !